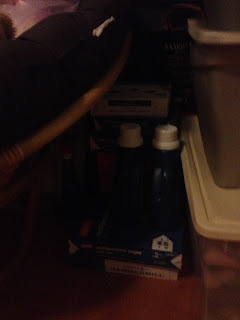 Balancing On My Toes: My Stockpile Organization! I'm going to warn you- my stockpile is nothing too fancy. I have simply tried to organize all my products by type in order to keep everything a bit more tidy. I keep all of my stockpile inside of my closet. I am extremely blessed with a huge closet- I have room to spare which gives me the space to keep a variety of products on hand! I keep all my tissues along the back of the above shelf. In the front I keep body wash (soap is hiding behind it)I also have makeup, vitamins, throat drops, and heat wraps. On the outside of the box, I have all my lotions that don't live in the bottom drawer of my jewelry armoire. These are my drugstore lotions and sample size lotions. I keep laundry soap and extra paper hidden under the chair in my closet. Under my purses is all household items, air fresheners, dish soap, and other household samples. Other items I have jammed around here? Paper towels, toilet paper, more makeup and nailpolish, feminine care items, and other odds and ends. Couponing has been such a provider over the past few months- I will never again pay full price for any of these items. I will never again make an online order without a coupon. I am prepared for whatever financial hardships come my way and I am so grateful for finding couponing. Have you started couponing yet?